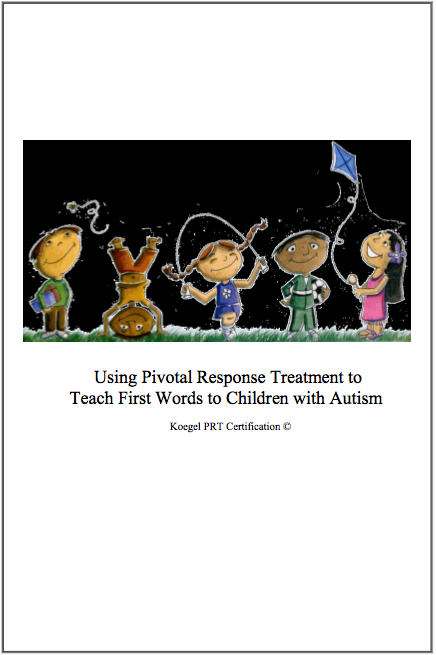 These training manuals cover a wide range of behavioral strategies that comprise PRT®. 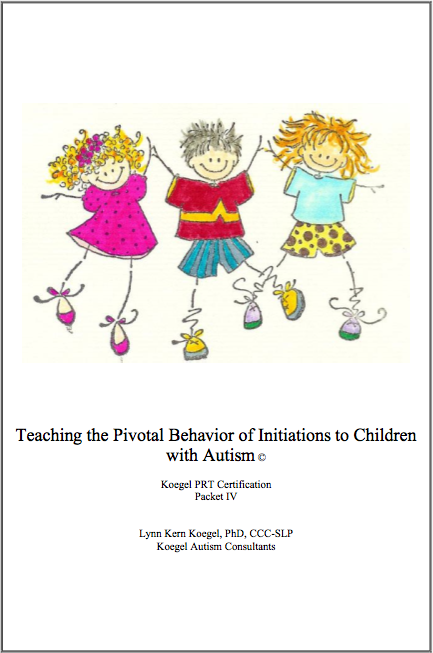 These manuals have been disseminated to parents and professionals who work with individuals with autism and ASD across the country and throughout the world. NEW! PRT® TRAINING MANUALS NOW AVAILABLE! 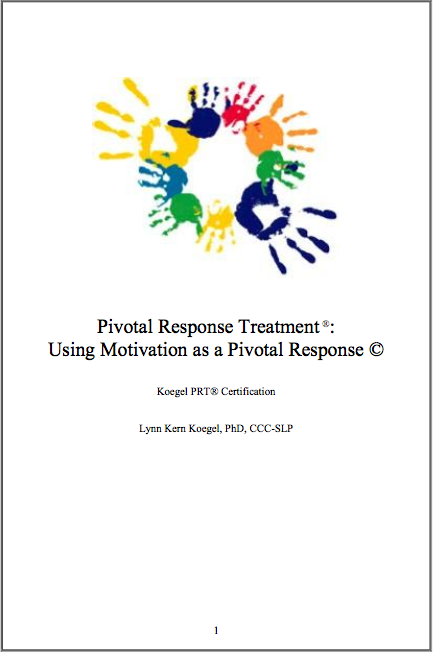 This PRT® Training Manual provides invaluable help and information to help you learn how to use motivation (using Child's Choice, or "following the child's lead") as a Pivotal Response with children with autism. 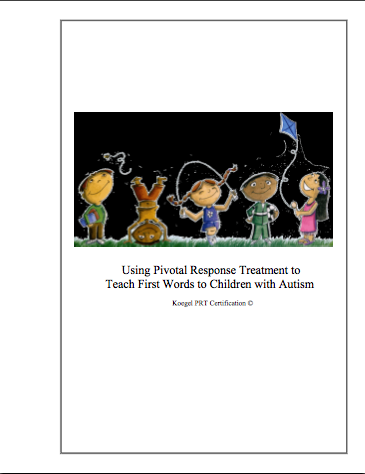 This training manual provides invaluable help and information to help teach a child their first words. Statistics show that the earlier you begin intervention, the greater your chances for success. Get started now. 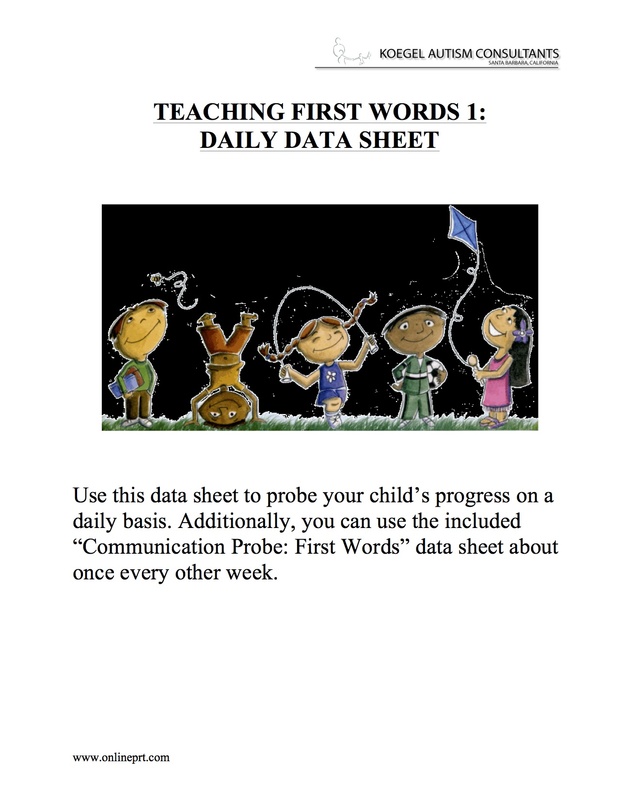 This first data sheet bundle is a great addition to the manual “Using PRT to Teach First Words to Children with Autism.” The included all-in-one and “Communication Probe: First Words” data sheets and easy-to-fill-in graphs will help you track your child’s progress as he or she is learning to talk. This will be most appropriate to use with children who have less than 10 recognizable words. Using initiations results in the kind of back-and-forth communication that is so important for communication, social, and academic competence. This manual helps you learn procedures to increase or teach initiations. 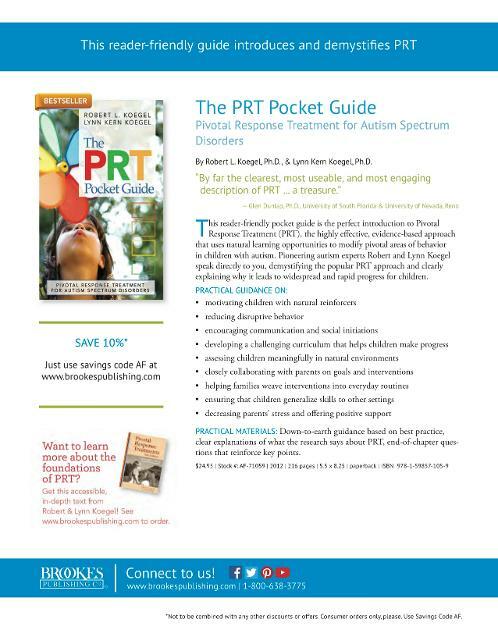 This just released PRT® Training Manual is the newest in the series and provides invaluable information on teaching social skills and facilitating social interactions between children with ASD and their typically developing siblings and peers. Note: The "Play Dates" manual is no longer available. Our new "Improving Socialization in Individuals with Autism" manual includes the information from the previous "Play Dates" manual, as well as updated information/procedures on facilitating social interactions. 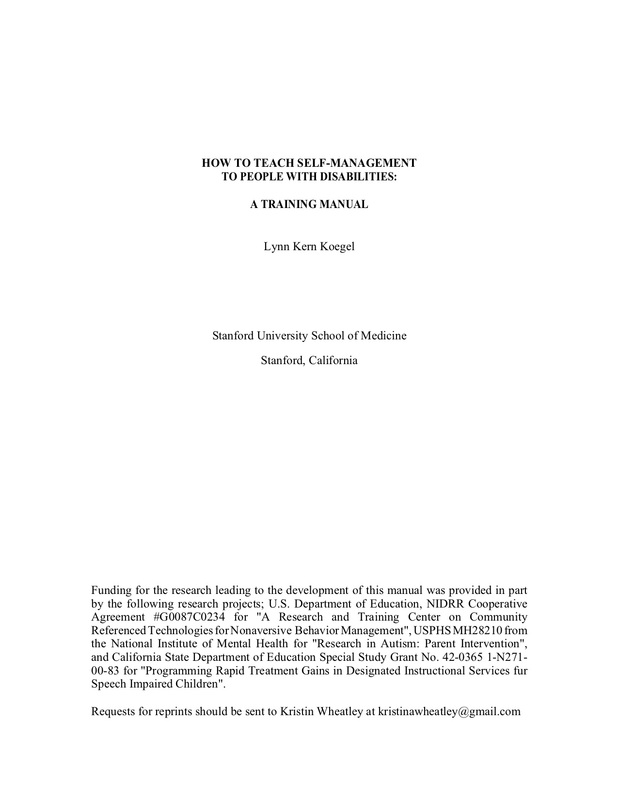 Self-management is a pivotal behavior, and an effective positive behavior support strategy that can be used with individuals with autism and other disabilities to decrease maladaptive behaviors and increase positive prosocial behaviors. When implementing self-management, a child is taught to identify and discriminate target behaviors, then monitor and identify the absence or occurrence of the behavior, record the behavior, and deliver contingent reinforcement. Teaching an individual to self-manage empowers he or she to act as his or her own agent of intervention, and transfers behavior control from the treatment provider to the individual with ASD and then natural contextual cues, and is an excellent strategy for inclusive environments. 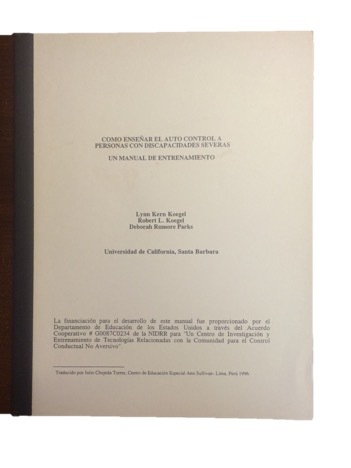 Instructs reader on how to perform a functional analysis, that is, how to recognize the function of the behavior that an individual is displaying, and how to use that information to modify the behavior to one that is appropriate and no longer disruptive. 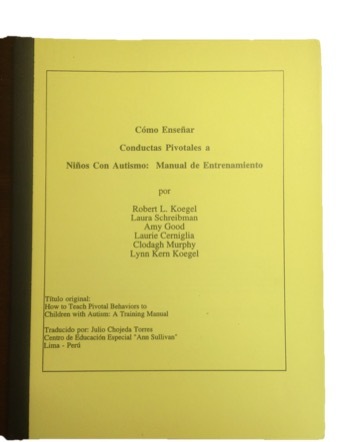 Intended for parents and educators to help a child with a disability who is included in a general education classroom to acquire new academic material with more ease and thus also to help reduce disruptive behavior. 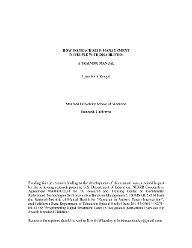 Outlines the elements of an effective partnership between parents and professionals for creating a successful program for a child with autism. 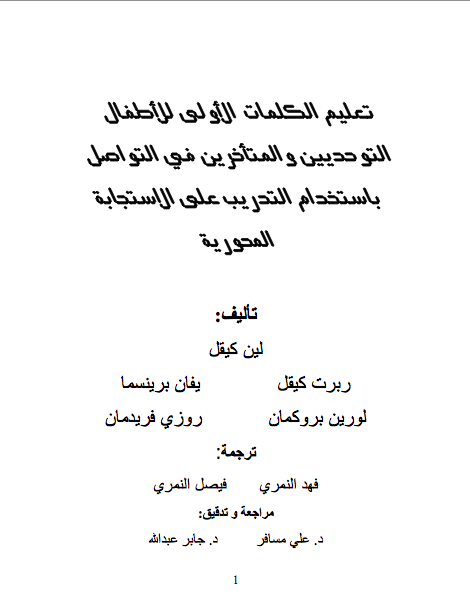 Outlines the steps to a toilet training program which has been proven to be successful with children with disabilities over very short time periods. NEW: Growing Up on the Spectrum - Discounted Prices while Limited Supplies Last! Available online at Amazon: Click here to purchase! New! 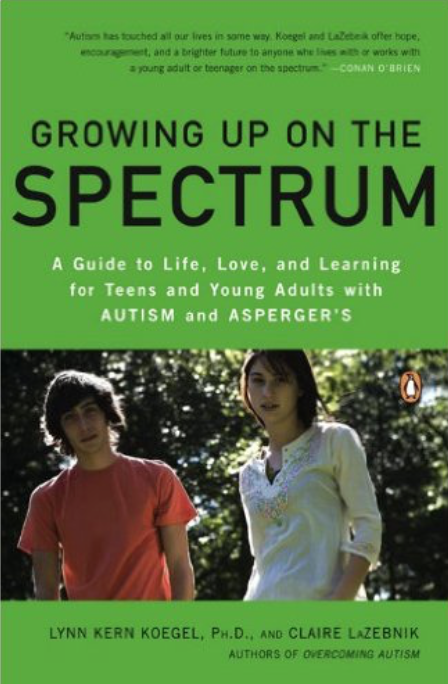 Growing up on the Spectrum: A guide to life, love and learning for teens and young adults with autism and asperger's. Includes chapters on terms, interventions and techniques, the importance of making and maintaing both good friendships and successful romantic relationships, making school successful, life beyond the college years, and skills on how to improve daily life. To purchase online through Amazon, click here. For a 10% discount when purchasing through Brooks Publishing, click here. Overcoming Autism: Finding the answers, strategies, and hope that can transform a child's life. A state of the art approach to reducing hte symptoms of Autism Spectrum Disorders. 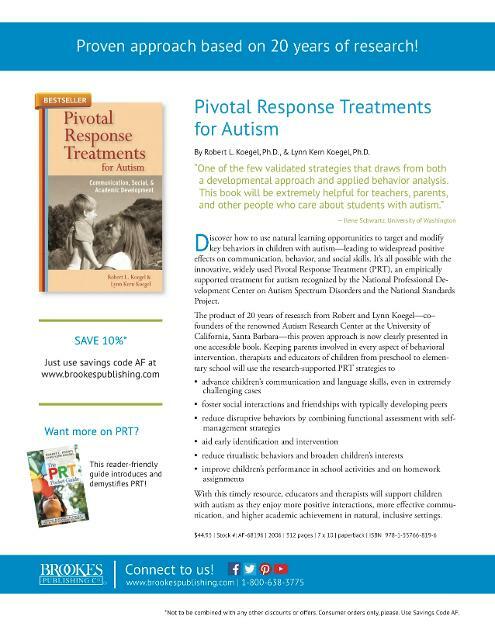 In this book, tools are given that offer concrete ways to immediately begin improving the symptoms of autism and the emotional life of anyone coping with the disorder. Positive Behavioral Support: Including people with difficult behavior in the community. Positive behavioral support incorporates a comprehensive set of procedures and support strategies employed on the basis of an individual's needs, characteristics and preferences. 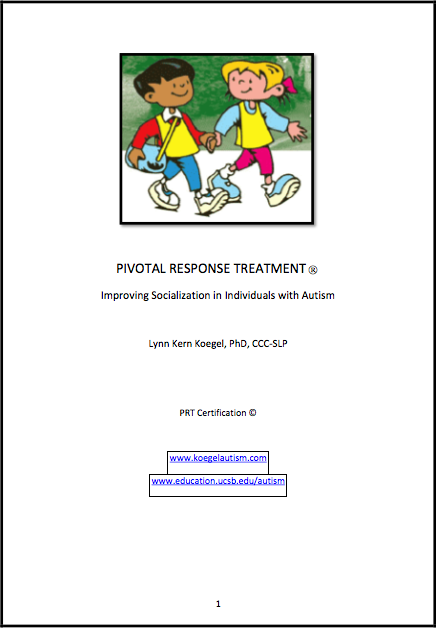 Pivotal Response Treatments for Autism: Communication, Academic and Social Development. Recognized as one of the top state-of-the-art treatments for autism in the U.S., PRT® uses natural learning opportunities to target and modify key behaviors in children with autism. Teaching Children With Autism: Strategies for initiating positive interactions and improving learning opportunities. The purpose of this book is to provide a useful conceptual and practical guide for teaching children with autism in a way that will maximize their developmental potential.